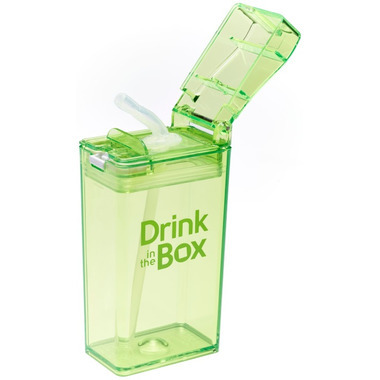 A revolutionary reusable drink box with a patented design and made from near indestructible Tritan plastic. Perfect for school yards, car rides, and picnics. The lid is leak proof and pops off easily for quick and easy filling and washing. 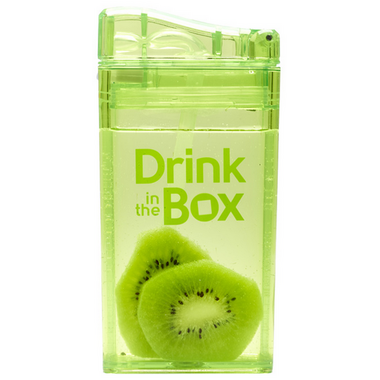 This great eco-friendly drink box is also BPA and phthalate free. 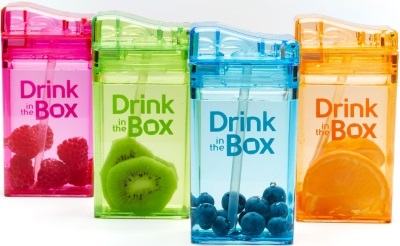 Drink in the Box (DIB) gives you control and variety, so you can give your children healthy alternatives. Just fill DIB with water and berries or sliced fruit, or squeeze your own fresh juice! These are great. No leaks and we have been using them since kindergarten! I bought it for my 7 years old kid and he loves it! It doesn't leak in the lunch box and the size is just perfect. These are great. They don't leak, and they are small enough to fit inside lunchboxes. Just remember to open the lid as you put it on after filling up, then close it after. Otherwise your kids will get spurted with water the first time they open it during the day! My daughter loves it so much, I bought 3 of them. They do not leak and are made of durable plastic. She says that when she uses the straw it's really smooth. My daughter is only 21 months and when she open the lid and put it upside down, the water running out of the straw. I guess this product is too early for my daughter but for sure it is heavy use product. I purchased this product because my kids had wrecked several drink bottles over the past year or so and I was looking for something a little more durable. So far this drink box has stood up to their heavy use (ex. being dropped/thrown from highchair height, traveling, and use at school). It has a good seal and doesn't leak because the lid pinches the straw closed. My 4 year old easily opens the lid by herself. Sometimes liquid will shoot out of the straw when you pop the lid open if you fill it just a little bit too full. So far so good! Bought this for my son in his K, and we both love it! It is not leaking and can easily for me to prepare him different drinks for him! Great product! We've been using it for about a month and haven't experienced any leaks? Fits great into my sons lunchbox. He's 4 years old and can easily open the lid where as my almost 3 year old struggles with the button. Really happy with this for my child's lunch box. Easy to use, cleans up well, and really cuts down on garbage/recycling from school lunches.